Federal produces high quality ammunition designed for reliable performance and an unbeatable price point. No matter what kind of shooting you do Federal has the right ammo for you. Federal Non-Typical uses an optimized soft point bullet design with a concentric precision jacket that provides you with devastating wound channels on any whitetail deer. Federal Non-Typical is specifically engineered for deer hunters to produces tag punching accuracy and constancy shot after shot. This is the ammo for hunters who take their sport seriously. Precision dawn Federal brass and consistent Federal primers ensure flawless performance you can rely on. While it is suitable for medium to large game, this ammunition is produced with the American Whitetail in mind. When that big bruiser buck is in your crosshairs the last thing you need to worry about it is whether or not you picked the right ammunition. Free your mind to take that shot with confidence, and fill your freezer. 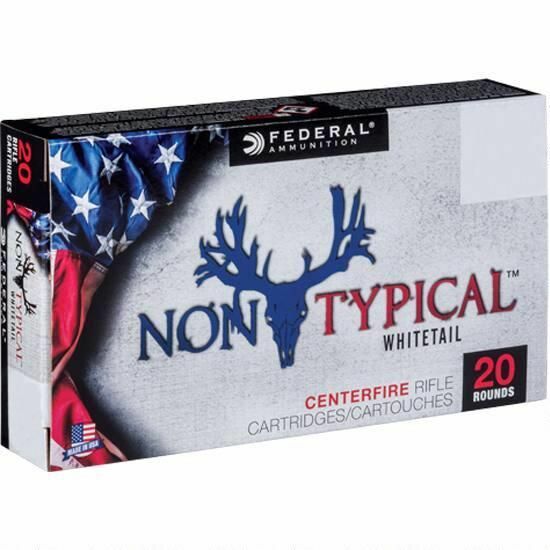 Pick up some Federal Non-Typical today!